Trill "Beep, The Synchronizer, "
Trill (トリル Toriru?) 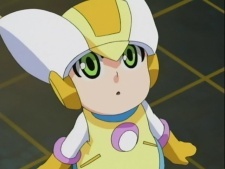 is a small NetNavi that grows from a baby to a young child, which is impossible for other NetNavis to do. He is an anime-exclusive character appearing in Rockman EXE Beast and Beast+, that comes from the world of Beyondard, a parallel world of Earth ruined by a Dimensional Area accident caused by that world's Dr. Wily. BubbleMan finds Trill crying when he falls out of an ice pillar in an Amerope military base's Cyberworld after Trill entered their world from a Fossa Ambience.